← Dancing, Biking and Racing – oh, my! We think this is kinda cool – you can be a part of a public art project spearheaded by Harwood Art Center and AMAFCA. 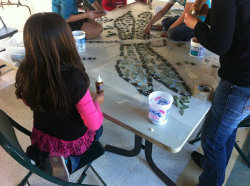 The project will incorporate mosaic tiled designs along sections of the ongoing Hahn Arroyo Project‘s pathways. There are several free public workshops, so think about attending one if you’d like to get involved. This entry was posted in Event Recommendations and tagged ABQCityLife, Albuquerque, AMAFCA, APPCityLife, City of Albuquerque, Events, Hahn Arroyo Project, Harwood Art Center, New Mexico, public art project. Bookmark the permalink.